My original plan was to do two songs each day, with those requiring a set-up change to amplified guitar scheduled for the second day. 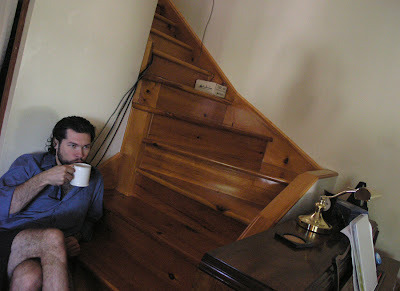 I had imagined the amp being so loud that we’d have to take a chunk of time to test out placement throughout the house. Nik took one look at the amp and said, “That’d be good in the downstairs bathroom,” and the problem was solved! So we managed to get three songs on the first day, which left “Walk With Me” for Saturday. We started off the day slow as Nik came early and got things warmed up and ready to rock. 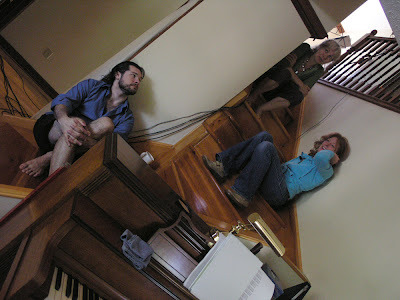 Katherine, Tannis, Jesse, and Adam arrived, the coffee flowed, and the breakfast treats got nibbled. 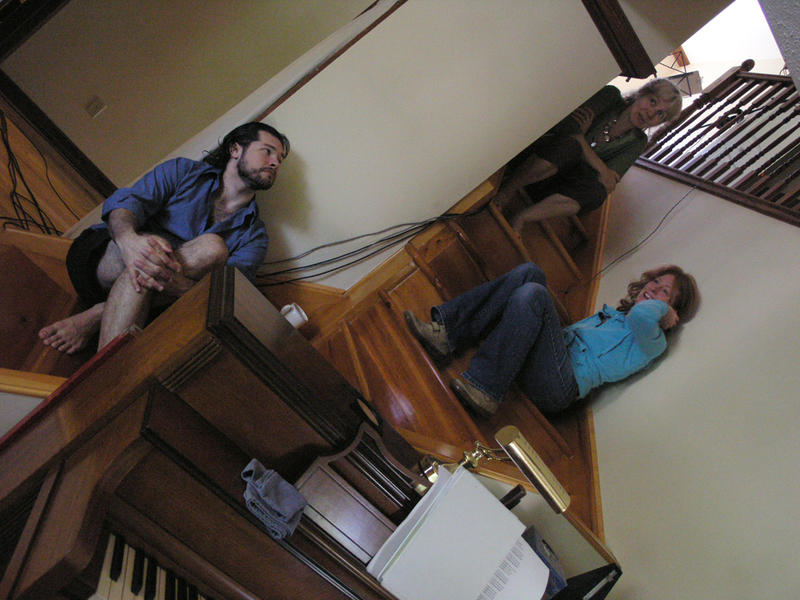 Jane practiced the series of drone chords for her accordion part. Katherine, Tannis and I went over the vocal parts, which were of the non-parallel variety Jane and I enjoy. Adam hovered over us pretending to be part of the vocal group! Jesse laid back as is his way. Nik mid’d the National both acoustically and from the amp, as I wanted some ”rumble,” and a wailing sound for the slide solo. When we were ready, the takes began. The intense vocal finale of this one took some work, but we finished it without too much trouble. It was time for a lunch break—and then what? 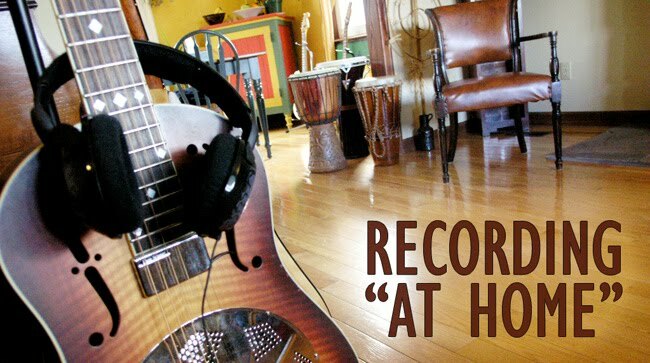 I decided to whip off another song, so I chose “I’m On My Way,” a traditional gospel tune that Jane and I play live. This song, with the call-and-response, “I’m on my way to freedom land,” was a standard during the civil rights marches of the 60s. When it comes to gospel music, I prefer the freedom and inspirational songs of African-American gospel, and this is a great one. We do this as a fast shuffle, and I played my Garrison acoustic through the amp with a rich tremolo, the way Pops Staples used to when he would do it. It’s a cheap guitar, but it sounds great amplified! Since I had not prepared to do this song, we had to work out the arrangement right there and then. It took a while for the ladies to sort out their parts, and just as we were ready to record, our next-door neighbour started mowing his lawn! Even with the windows closed, the mower rumble was leaking through the mics. It’s been a cold, wet, spring, and it was sunny day with rain forecast for Sunday. Our neighbour clearly wanted to get the long grass cut before the next rain, so I couldn’t blame him. Nik—who loves to work—happily carried on with other engineering duties while the rest of us hung out on the back porch, ate, drank, and made merry. When the mower was at the far reaches of the yard, we did a test and decided it was safe to resume. For our final sessions later in June I intend to ask all our neighbours to schedule excessive noise on other days! “I’m On My Way” was fun to record, but without prior rehearsal, it did take longer than expected. Jesse, Adam, and I got a kick out of what was happening at the end of every take. The final sounds would tail off, and when everything was clear, Katherine, Tannis, and Jane would burst into an animated discussion about who was supposed to go up, down, extend, or clip a line shorter! I don’t think they ever finalized what they were doing—but it sounded great! And then it was homemade pizza time! Waking up . . .
More waking up . . . Joking about waking up . 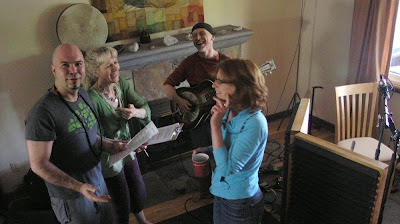 . .
Tannis, Katherine, and I going over the vocal parts for "Walk With Me," while Jane scrutinizes. "What? What? There's no falsetto vocal part for me? Frankie Valli's my main man!" Grease IS the WORD ... believe that!